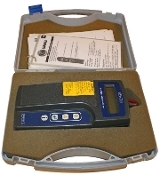 Conductance measurement with ability to measure battery voltage and current capacity of battery. From SAAB Cars USA, not a dealer. Very well maintained, case a little dirty.